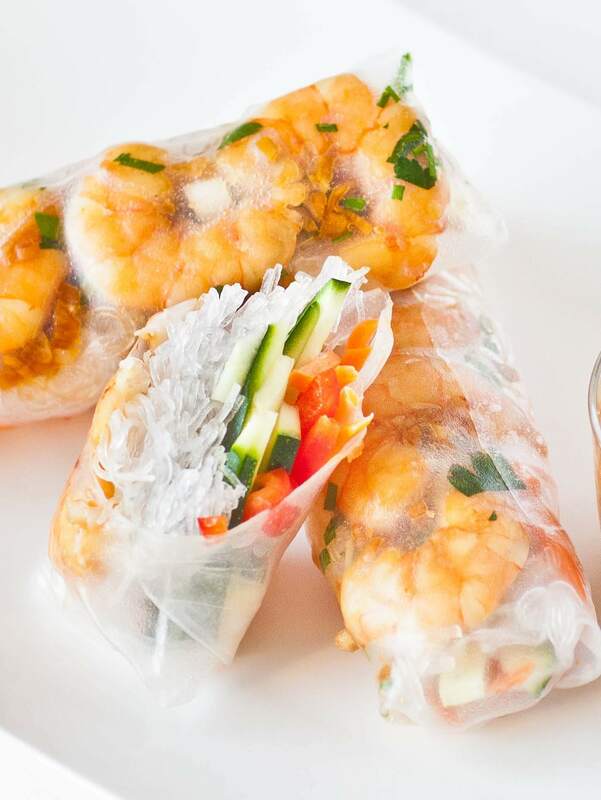 A simple and amazingly delicious recipe for Thai shrimp spring rolls! Plus, easy recipe for a ginger-garlic peanut dipping sauce. Enjoyed this recipe? Please share and save to your Pinterest! Prepare dipping sauce. Simply whisk together required ingredients and set aside. Prepare all filling ingredients. Prepare rice noodles according to package directions. In most cases, you will need to simply drop them into hot, just boiled water until noodles are soft, about 2 minutes, then remove. Clean and prepare shrimp and set aside. Combine in small bowl the fish sauce, sesame and chili oil and tamari sauce. Preheat a large sauté pan over medium heat. Add the ginger and garlic along with ½ tablespoon of cooking oil. Sauté ginger and garlic for 2 to 3 minutes, then add the prepared sauce. Cook for another 2 to 3 minutes then add the shrimp. Cook shrimp 2 minutes on each side. Remove sauce and shrimp into bowl and toss with parsley and green onion. To assemble rolls, prepare a large bowl with cold water. Dip rice paper into water for a few seconds until softened. Cut shrimp in half along the crest and place into the center of the roll. Top with some of the cooking sauce, ginger and garlic. Follow with prepared rice noodles and desired vegetables. Feel free to add your choice of vegetables including sprouts, mushrooms, etc. Fold sides into the center then carefully roll up the spring roll and set onto serving plate. Serve with dipping sauce.